Politicians and awkward embraces go hand-in-hand. We've seen it with former presidential hopeful Ted Cruz on multiple occasions, like when his daughter did everything she could to get out of a hug with him or when he accidentally elbowed his wife in the face during his campaign concession speech in Indiana. The latest in a long line of cringe-worthy moments during the 2016 election season happened to come from the second presidential debate on Sunday. 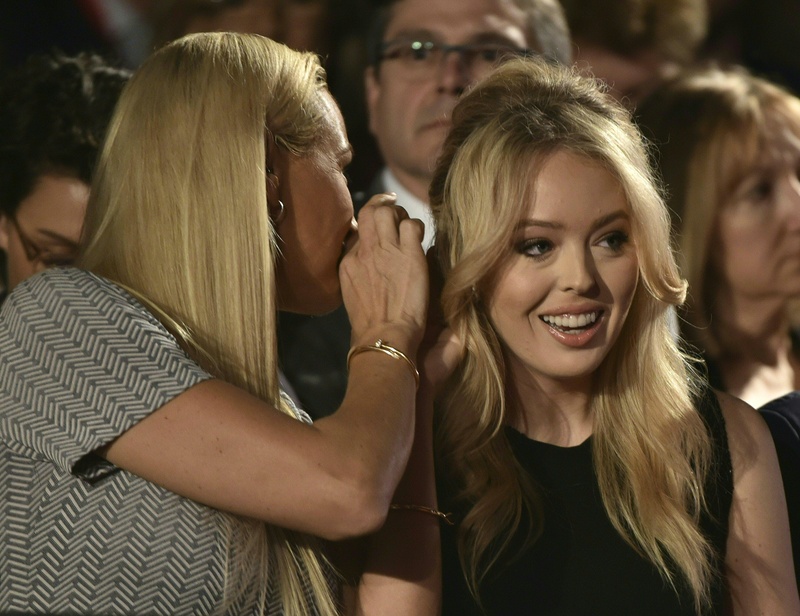 Sidestepping his affection and rubbing his shoulder instead, Tiffany Trump ducked kissing Donald Trump, her dad. Considering just how reluctant Tiffany was to be outwardly loving to her father, their interaction could barely be construed as a hug. The stilted interaction comes shortly after Tiffany had walked over to the debate stage at Washington University from where she was sitting. It's not exactly strange that she would be in attendance to support the Donald. The fact that Tiffany sat with the in-laws rather than her half-siblings certainly sends a pretty strong message, though. She was also the last Trump to join Melania, Donald, Ivanka, Eric, and Donald Jr. onstage after the debate had concluded. Her father and step-family all watched Tiffany walk over to Donald and smile as she dodged his advance. Now that's awkward. It's unclear what's going on between the 22-year-old and the rest of the Trump family — or whether anything's going on at all for that matter. While 10-year-old Barron has been understandably shielded from the harsh scrutiny of the campaign trail, Tiffany has also been in the shadows of the spotlight. Though she spoke at the Republican National Convention, she has otherwise kept a low profile. That may soon change when the daughter of Trump and his second wife, Marla Maples, begins performing campaign outreach in order to better reach millennial voters. According to a recent New York Times profile about Tiffany, "Mr. Trump's team appears to be grooming Tiffany — gingerly — to pitch in on the campaign trail in the coming weeks." No one really knows for sure if and when Tiffany will play a more active role in Donald's campaign. It's similarly unclear whether she even wants to assume those kinds of responsibilities. Perhaps she ducked his affection in light of the scandal that dominated the news cycle over the weekend. And perhaps, on the other hand, Tiffany was showing a bit of forethought when she chose to smile, turn her head, and keep on walking — a key quality when campaigning. Most likely, however, she was probably embarrassed to be kissed on the cheek by her dad on a national stage.